WASHINGTON? LockheedMartin officials alongwith Colorado lawmakers are warning that NASA's spending plan for theOrioncrew capsule over the next year is insufficient to retain the program'scurrentdevelopment work force and would make it difficult to conduct a flighttest ofa vehicle prototype the company envisions for late 2013. Inan Oct. 8 letter to U.S. President Barack Obama, Sen. Michael Bennetand Rep.Ed Perlmutter ? both Colorado Democrats ? said until Congress hammersout a new2011 spending bill, NASA must fully fund Orion'scontinueddevelopment as a crew exploration vehicle, regardless of thepresident'splan to scale it back for use as a crew lifeboat on the internationalspace station. Thethree-year, $58 billion NASA authorization bill the president signedinto lawOct. 11 calls for $1.1 billion to be spent in 2011 to develop withinfive yearsa multipurpose crew vehicle capable of carrying astronauts on deepspace missions. Althoughthe new law does not specify Orion as that vehicle, draft legislationapprovedin July by the Senate Appropriations Committee directs work on Orion tocontinueand provides $1.1 billion for that purpose. That bill has yet to beapproved bythe full Senate, but elements of the legislation are likely to beworked into abroader spending package when lawmakers reconvene after midtermelections inNovember. NASAofficials say the agency is still determining how to proceed withOrion. NASAspokesman Bob Jacobs said the agency still plans to build a scaled-backversionof Orion for use as a crew rescue vehicle as called for in April byObama. Inan Oct. 13 e-mail, Jacobs said an Orion-basedcrew lifeboat is preferable to outsourcing that capability tothe privatesector, as NASA plans to do with the launching of astronauts to thespacestation. "Wewouldn't want commercial crew providers to have to leave a capsuleattached tothe [International Space Station] for use as a rescue vehicle," Jacobssaid. "It would be a difficult expense for them to maintain." Instead,he said, the agency has an opportunity to build a vehicle that startsout as aspace station crew lifeboat and, through a series of evolutionaryupgrades,eventually can be used to transport astronauts beyond low-Earth orbit. Jacobssaid, "It would seem that Orion would be the vehicle," but added thatall options are being weighed. "Forexample, how does the [crew rescue vehicle] development impact theexistingcontract?" Jacobs said. "Do we keep the same contract and modify itor do we have to start over? Those decisions still have to be made." JohnKaras, vice president and general manager for human spaceflight systemsatDenver-based Lockheed Martin Space Systems, expressed surprise thatNASA isstill considering plans to proceed with a crew rescue variant of Orionin lightof the congressional direction and the fact that the vehicle asoriginallydesigned "gives you crew rescue capability at no additional cost." UntilCongress enacts a 2011 budget, NASA is requiredto fund Orion at levels no higher than those set in lastyear'sappropriation. However, the CR gives NASA some leeway to reduce or slowspending until a new appropriations bill is signed into law. Inan Oct. 15 e-mail, NASA spokesman Michael Braukus said the agency planstospend a total of about $190 million on the Orion prime contract betweenOct. 1,when the CR went into effect, and Dec. 3, when it is slated to expire. 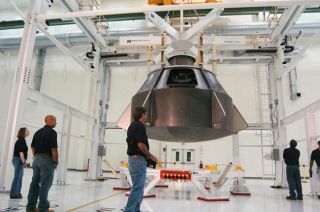 Ifthe CR is extended, however, the average spend rate could dropsignificantly,to around $60 million per month, based on an assumed total Orion budgetof $800million for 2011, according to NASA and Lockheed sources. Karassaid NASA has told Lockheed Martin to expect a 20 percent drop in Orionspending in 2011 compared with 2010. This could affect, by the end ofthe 2010calendar year, some 700 Orion workers, who would have to be moved tootherprograms or let go, he said. Karasadded that NASA spending on the Orion contract in 2010 averaged about$96million per month, or $1.15 billion over the course of the year. "Assumingthe CR allowed us to maintain the funding we had in , then wewouldn'thave to be making any head count adjustments right now," he said. Karasalso said the lower spending rate ultimately could hinder efforts toconduct anunmanned test of Orion in late 2013 atop a United Launch Alliance Delta4 heavy-liftrocket. He said the test flight would prove key Oriontechnologies,including the capsule's main engine and solar arrays needed fordeep-spacemissions. "Ifyou have to be operational by 2016, somewhere along the way we have toreconcile that, and the only way for us to meet that is to continue tomakeprogress and fly something," Karas said, adding that if NASA wouldmaintain 2010 spending under the continuing resolution for the program,andcongressional appropriators fund authorized spending levels in 2011,"we'regoing to go have a hell of a flight demonstration at the end of 2013."